Ten boats were out for the last day of racing at the Lake. The mixed fleet raced on handicap and with a first and a second Martin Brennan in a Solo was the clear winner. In the first race, the RS400 helmed by Ste Mason, with Adam McGovern, soon got way past the Merlin Rockets but its handicap was too much. For the second race, they swapped boats with Steve Crook and Sally Townend. As Les Bithell and Jan MacNeill got clear to lead the Merlins neither Steve Crook in the RS400 nor Ste Mason in the Merlin were able to break away. The westerly wind provided good conditions to end the season. The results below are on the usual class basis. Racing starts again on 5th March. The penultimate day of sailing at the Lake seemed to provide conditions that, in summer, might be ideal. Plenty of sunshine and a moderate easterly breeze attracted a few keen sailors. However, the wind proved inconsistent in the first race and Martin Brennan with Chris Massey in a GP14 had plenty of experience between them to find the best way, despite the challenge of Adam McGovern and Ste Mason. Indeed, although the Merlin Rocket of Martin and Rene Watts should be faster, they were beaten to the finish by the GP14. The second race started well until the wind suddenly increased and white ‘horses’ appeared. A Laser capsized and some others hurried home to the harbour while the two leading GP14s continued to race. The continuing cold weather with a light wind did not deter keen sailors from racing on Sunday. At the start of the first race, it looked as if the wind might disappear but, after a while, it filled in again and places were secured. Once away in the lead, few place changes happened. Martin Brennan was always ahead in the Solos, while challenger Chris Massey swapped his Solo with Richard Whitehill’s Laser in the second race. In the Merlin Rockets, Martin and Rene Watts, challenged in the first race by Les Bithell and Jan MacNeill, had the best of the day. Most GP14s decided that 2 races was enough, but novice Les Burns, with Richard Hodgson, decided to keep going for the third race. It was surprisingly calm again for sailing and some may have still been recovering from our excellent and well attended Dinner Dance and Annual Prizegiving the night before. The light air was a cold northerly which shifted from the east to the west and lasted just long enough for two races. It was mainly the stalwarts who turned out to race though Chris Massey took a novice out in a GP14 and took the lead. Richard Whitworth was up from the south for the Dinner Dance and borrowed a Solo, but was unable to break Martin Brennan’s lead. The two Merlin Rockets challenged each other and took turns with the wins. The calm of Sunday delivered just enough wind for the usual three races. At least the westerly direction stayed the same. The five GP14s were joined for the first race by a lone Mirror. Martin Brennan and Steve Caladine led the first race but were challenged closely by Adam McGovern and Ste Mason who, on the final leg looked in a better airstream but could not manage to get ahead. In the other two races, Colin Knott and Richard Long showed the way round by taking a different line on the downwind legs, while Martin Brennan’s usual ability to ‘snuff out’ the best way failed on this occasion. Five GP14s prepared to race at the Lake on Sunday, until wind conditions worsened. The strong north west wind was blustery as three boats were on the start line, joined by young Evan Parry and sister Zoe in a RS Feva. In the race, the Feva capsized and two of the GP14s decided it was too much and retired, leaving Tom Daniel at the helm with Steve Caladine to win. The wind subsequently eased for two more races and, with a change of helms, Martin Brennan and Richard Long led the way. Last Sunday the skills of sailors were tested in light weather conditions. This was a great contrast with the week before, when an easterly wind blew strongly and there was a reluctance to leave the harbour. However the light wind only lasted long enough for two races to be sailed as the Lake took on a glassy appearance after 3pm. The 7 Merlin Rockets had close racing, led in the first race by Julian Parry and son Evan. They switched roles in the second race and it looked as if Evan would helm the boat to a third place, but they were denied that result on the line. Although Steve Crook and Sally Townend had the best results overall, there was quite a difference between the two races. Ste Mason and Adam McGovern raced with the Merlins in a RS400 and showed the way round in the second race. Seven of the Club’s junior sailors have been competing in a 10 event series around the North West where there have been 97 participants. Best results came from Adam Din finishing 4th overall, just ahead of Will Smith 5th and William Rowland in 7th place. The North Easterly direction delivered a strong wind on the lake today with the GP14 fleet the only boats to take to the water. The decision was made to postpone the Autumn Pursuit race however the GP14s took advantage of the wind and enjoyed a great race, well done to Chris Massey and Tom Daniels who took the race win. The three races at the Lake on Sunday, after the rain had cleared, produced consistent results in each of the fleets. The first race was sailed in a quite gusty southerly wind where some sailors refrained from setting spinnakers. After that, the day settled and there was closer racing from the start. Nick Brook relished the conditions in a Solo and Bruce Mager with Craig Jowett had no problem in keeping ahead in his Merlin Rocket. In a change of place, Martin Brennan crewed for Colin Knott in a GP14 and kept their boat in the lead. Chris Gould and Chris Kilsby were the clear winners of the Felucca Trophy on its 60th anniversary, while the Club and the MROA celebrate their respective 70th anniversaries. Thanks to sponsorship from Craftinsure (and their support of the Silver Tiller, raced on Sunday) there were also spot prizes to be won. The forecast for the weekend had indicated steady north east winds between 8 and 12 mph. In reality, it was not as stable as that! There was plenty of bright sunshine and, usually, an easterly wind at Hollingworth Lake can be stronger than expected. At least it meant that a maximum length beat could be set. That Saturday’s two races were started without a black flag was a pleasant surprise with a fleet of 19 competitive Merlins. Last year’s winner, Caroline Croft, with Beka Jones, found the way to lead the first race only to find sisterly pairing of Jen Dodds and Pippa Taylor getting a better starboard lift to catch them, and take the lead to the finish with the Chris team following, ahead of Andy ‘Taxi’ Davies and Chris Dodds. A change of course for the second race and this time it was Taxi and Chris Dodds who found the way to lead, followed by David and Oliver Winder. Behind, there was some place changing with Caroline Croft gaining third place and Richad Whitworth, with Sally Townend, expected to have enough local knowledge from his past time here to benefit his chances. At this stage, it was looking as if any one of 7 boats could take the event. The evening witnessed the usual social and excellent Felucca dinner served by club members. However, there did not seem to be too many sore heads on the Sunday morning. That day’s racing was for the Silver Tiller series. Again, the first race got away clean and no black flag. While the Chris team were off and away, Richard Whitworth knew where to start on the line at the leeward end and hold for a port lift which brought him into second place ahead of Taxi and the sisters. While the Chris team built up a 2 minute lead the 3 boats behind jostled closely for their places. After a good lunch, the final two races were sailed back-to-back. The first start resulted in a recall and the black flag at last, with one boat clearly over. Again the Chris team showed the way, except on the second lap, Simon Potts and Ally Martin were on form and briefly took the lead, only to sail off in the hope of a port lift to the windward mark which failed to materialise, losing out to the Chris team and the sisters. The clouds passing over were unsettling the wind direction more for the final race. The black flag did not hold back the fleet enough. Julian Parry and son Evan were fortunate to round the windward mark ahead as the wind died away and calm descended as others struggled to keep moving. A roguish black cloud took the wind into the south-east and the race got underway again, but the Parrys were too far ahead to be challenged while Caroline Croft sailed steadily in second, with the Chris team keeping going in third. So Chris Gould and Chris Kilsby won the overall event and the Silver Tiller result, while behind places were closely fought in the following six results. There could scarcely have been a greater contrast for sailors on Sunday after the squalls of the previous Sunday’s racing. At first it seemed that there would be a good easterly breeze for tactical sailing. It soon played tricks by changing direction and disappearing. All 3 races were shortened. The 8 Merlin Rockets out were testing their skills in preparation for next weekend’s Felucca Trophy races. The results were very mixed with Steve Crook and Sally Townend taking the first race and Julian and Evan Parry the second one. All started the third race and, finding the wind easing away, left Les Bithell with Jan MacNeill and Martin and Rene Watts battle it out. The GP14s attracted some of the novice racers to have a go, though Colin Knott and Richard Long were easy winners. It is not uncommon for gales around the time of the equinox and all seemed fine as boats set out to compete for the Club Championship. It was breezy but good racing conditions. All the different classes started together and raced on a handicap basis, also divided into Gold, Silver and Bronze leagues. Two Merlin Rockets led the way in the first race with a GP14 finishing in third place. Steve Crook and Sally Townend continued to master the conditions in the second race with Nick Brook in a Solo revelling in the strengthening wind. By the third race squalls would make an impact. Depending on which leg of the race boats were on could determine survival or a capsize. 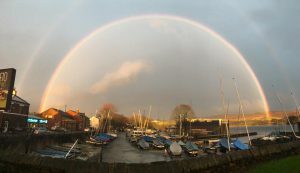 There was no time to admire the rainbows as half the fleet turned over! Nick Brook won the last race, ahead of the Merlins of Steve Crook and Nick Heginbotham with Jane Clayton. The main event for Club sailors over the weekend was participation in the annual 24 Hour Race on the Marine Lake at Southport. While that started in glorious weather with a light breeze and great sunshine, the team did not maintain its potential placing when the wind died away in the evening but we did finish a credible 33rd out of 82 entrants. There were only a few boats out to race at the Lake where the wind certainly varied much in strength and direction. Once again Nick Brook led the way for the Solos, while Mike Butler, with Andrew Hilton, in a GP14 led all the races until overtaken in the second one in the later stages. Conditions for racing at the Lake on Sunday were glorious with sunshine and a south westerly breeze. The breeze, however, proved too strong for some sailors and there were a couple of capsizes in the Solos. While Martin Brennan sailed consistently in a Solo, he could not hold back Nick Brook, particularly in Race 3, when he had the early lead. The 2 Merlin Rockets raced very closely in all the races, flying downwind with their spinnakers. It was good to see that 16 boats set out for the final Wednesday race of the year. It was a sunny evening with a light southerly wind. For one reason or another, a line start was used and it was the GP14s who led the way rounding the first mark! But 2 Merlins soon got ahead and then the wind eased away to a light air and the race was shortened during the second lap. Nick Brook in his Solo had the most consistent racing results despite winds that gave strong gusts which ‘headed or lifted’. This can equate to snakes and ladders on the board game. On this occasion the usually wind aware Martin Brennan could not do better than second. The Merlin Rockets had the closest racing where Nick Heginbotham, and daughter Lucy, returning from holiday, had the best day. One boat, remaining anonymous, capsized when well placed. There was a good turnout for the penultimate Wednesday evening race. So it was a somewhat crowded start line which led to a few being called back. There was little doubt about the best place to start and, in a moderate F2 westerly, most Merlins raced away though Chris Massey (Solo) kept up with them early on. In the end, Steve Crook, with guest crew Tom Daniel, were far ahead, while Roger and John Mee kept ahead of Les Bithell and Jan MacNeil. Adam and Tim McGovern were off to the lead in the GP14s but were caught and overhauled by Martin Brennan and Sophia Miles. As Gary Butler was late starting, Richard Whitehill seized the opportunity to lead the Lasers (and luffed Ron Simpson, in his Solo, far to windward between H and C). Near the finish, 2 Lasers ran aground off cafe point (names withheld!). As luck would have it, the essential element of wind was missing for sailors on Sunday. In a light air, 8 boats set out to race but before the first lap was completed the wind evaporated and 3 boats only finished a shortened course, while others paddled their way in. With the lake taking on a glassy appearance, racing was abandoned for the day, though some wind filled in much later. It was probably inevitable that there would be a calm Wednesday evening before the end of the season and the Lake was mirror-like on arrival. However a very light northerly air stream developed and racing went ahead. Mike Smith and Andy Wake were off in the Solos, leaving Rod Daniel behind. Mike Butler and Steve Caladine were ready and away to a flying start in the GP14s, challenged in the later stages by Martin Brennan and Sophia Miles, light wind experts, but held the lead to the finish. The Merlins do well in such light airs and Steve Crook and Sally Townend even showed speed round the course, though Martin and Rene Watts were not far behind. Roger and John Mee caught up for third place, out of the five racing. The Sailing Club on Sunday reacted to the ‘Olympic bounce’ with several people asking to have a taster session, as with other sports. The afternoon saw the usual suspects taking the lead in the handicap races where the results were consistent. Chris Massey was in best form winning in a Solo, followed by Martin Brennan, also Solo, while Tom Daniel and Andy Hilton in a Merlin Rocket, always leading the pack, took third place. Conditions for racing on Wednesday evenings this season have generally been excellent and this evening was no exception. With a wind blowing into the harbour, the only problem was launching and sailing out. Indeed the wind built up as the evening progressed. The lone Solo was off and away, next came the 5 GP14s with a close race at the first mark. The long run back, under spinnaker, saw Martin Brennan and Steve Caladine ahead of Graham Knox and Alisha Haywood-Singh, behind there was some jostling for places. However the lead never changed. Roger and John Mee were challenging in the Merlins but could not hold the lead as Guy Winder and Tom Murphy on top form romped away. Meanwhile Chris Massey and Oliver Whitehead enjoyed racing into a secure second place. The 3 Lasers were led, as usual, by Gary Butler with Tom Daniel showing the range of his skills. It looked as if Tom Daniel and Oliver Whitehead, sailing a Merlin Rocket, would be the obvious winners racing on Sunday. Whilst they quickly gained the lead, when the handicap was applied, they were only far enough ahead in the third race to win, when they did not have such a good start! The wind was patchy and generally from the north. In such conditions, Martin Brennan in a Solo could ‘sniff out’ the way to lead in the first 2 races and do well also in the third. Also finding the best way in the first race were Pete Bramwell and Steve Caladine in a GP14. Despite drizzle, there were 14 boats out as the wind freshened from the south west. In the thick cloud it was decided to sail one race only. Oliver Whitehead quickly raced off in the Solos ahead of Andy Wake. Meanwhile the 6 GP14s raced closely at first until Martin Brennan and Sophia Miles sprinted away, followed by Ste Mason with Adam McGovern crewing. On the second lap, Graham Knox and Alisha Haywood Singh pulled through to fourth place closing on Nick Hornsby with Steve Caladine at the last mark. In the Merlins, Tom Daniel and Tom Murphy gave strong chase to Steve Crook and Sally Townend. With many away on holiday and the forecast of strong winds, there were few sailors out on Sunday. Adam McGovern with Steve Mason were well able to compete successfully in a GP14, winning against the Solos, where the results were shared between Oliver Whitehead and Nick Brook. During this month, results will be based on handicaps. On Wednesday evening sailors we met by unusually windy conditions for this time of year which resulted in a number deciding not to venture out on the water. However a total of 15 boats set out to race but before long quite a few of them were practising their capsize recovery skills. 7 boats displayed good heavy weather racing skills and completed the race. All of the sailors had built up their appetites (let’s face it swimming around the lake does make you hungry) which was then satisfied by the Italian supper that had been prepared by Pat Brook. Thanks Pat for another good After Sailing Supper. During the summer holiday season, starting now, racing is run with a mass start of all the different classes and on a handicap basis. The results shown below are on the actual finishing places. Bruce Mager and Craig Jowett seemed to have the Merlin Rockets under control until the last race when Tom Daniel and Andy Hilton claimed victory. In the Solos, Oliver Whitehead, fresh from a week of sailing at Abersoch where he came 5th overall, was in charge with comfortable wins. The GP14s had the closest racing in the shifty north-west wind with Pete Bramwell winning the first race with Steve Caladine crewing and the second race with his wife, Rhiann. Sailors were too keen to start the third race which had to be restarted several times before getting away. Luck has stayed with the two-race format on Wednesday evenings as another sunny day provided suitable wind, from the north west. It was however very shifty and easily caught out the lay-line with a sudden backer! 17 boats were out, led by the Solos. David Smith got clear away in the first race, but grit and determination by Andy Wake put him in second place in race 2. So David Hughes had the best of the evening. In the GP14s, honours were split evenly between Martin Brennan with Sophia Miles and Mike Butler with Steve Caladine who overtook the leader in the second race, held to the finish. The Merlins had interesting results too. Steve Crook and Sally Townend won the first race ahead of David and Oliver Winder, who won the second race. Behind them Guy and Joe Winder looked set to hold second place in race 2 but were overtaken by Steve Crook in a nail-biting finish on the line. Although the Laser results are subject to handicapping, Will Smith, leader of the first race, was obviously benefitting from this week’s coaching. Another sunny Sunday with a shifting westerly wind that kept trying to go more to the south. Most activity was in four GP14s who had close racing. Andy & Elmarie Carter ran away with the first race but did not fare so well in the second. Their lead was whittled away by Mike Butler and Steve Caladine, before Colin Knott and Richard Long took advantage at the leeward mark in the second race. In the Solos, Martin Brennan and Nigel Davey had 2 races of ‘cat and mouse’ close racing. There were 3 generations of Winders sailing in the Merlins. David led the way with his son Oliver, while Guy had his grandson Joe for crew. Conditions remained good for 2 races on another sunny evening. There was some banter among the Solos as Oliver had started late in the first race to give others a sporting chance, as the race was shortened he did not have time to overtake Kevin Parry who got second. While in the next race, Andy Wake came from last to challenge David Hughes for second place. The experience of Roger and John Mee led them to lead the Merlins. The GP14 results showed a reverse for the lead between the 2 races. And that spread to the Lasers with Richard Whitehill winning the second race. Glorious sunshine brightened sailing prospects at the Lake on Sunday. While there was wind, it was varying a lot between south-west and north-west. So it could be rather like snakes and ladders, if you caught the right shifts you gained. Adam McGovern and Ellie Davies always got it right in the GP14s, while behind them, in races 2 & 3, there was close competition and place changing. Martin Brennan, sailing a Solo, has a sharp eye for such conditions and took 3 bullets too. In the second race, Gerald Whitehead (Solo) ran aground on the Cafe point, perhaps hoping to get an ice-cream there! Another evening when the wind held to permit 2 races back-to-back. There was a familiarity about the results from the previous week! The Solos were most numerous with closer racing and Andy Wake trying hard to get into the top three. Merlin interest lies down in Salcombe where it seems that Steve Crook and Sally Townend are the leading HLSC boat, though Simon Blake and Pippa Taylor are sailing under our Club name and doing better. With the sailing season in full swing, there has been much activity at the Lake recently. On Tuesday, 5th July, an Open event for sailors aged over 50 was held, part of a Senior Travellers series, with 16 boats out. Best placed local sailors were Mike Butler and Steve Caladine in 4th place. On Saturday, an Open event for Solos brought 16 boats to the start line, despite the rain. While Andy McKee from Dovestone won the first race, Jack Hopkins from Delph, near Bolton, was in strong form winning the next two races and the event. Chris Massey in 8th place, ahead of Oliver Whitehead were the best local sailors. Meanwhile, 2 of the Club’s younger sailors have been taking part in a Laser Youth event in France. Adam Din and William Rowland will return with great experiences there. As many of the Merlin Rocket sailors are away in Salcombe, there were fewer boats out than usual. The GP14s had close racing and place changing. The forecast rain did not deter 16 sailors, including one from Scotland, who arrived at the start line. One absentee was Steve Denison who had won the Club’s Founders Plate racing the week before and the Solo Northern Championship a fortnight ago. Innes Armstrong, who is a past winner, got a good port end start and established a clear lead over the fleet. However, some had suffered from a messy start including Oliver Whitehead and Jack Hopkins who had to return and restart. Whitehead meanwhile was left in ‘irons’. From that position, Hopkins had to struggle to make progress in the competitive fleet. Andy McKee, Scorpion Champion, had borrowed a Solo and had a good enough start to hunt down Armstrong. In a tacking duel, McKee managed to gain the advantage on the line, with Lee Tennant in third place. After the lunch break, two races were sailed back-to-back. This time, Hopkins made no mistake and got clear away into a lead that he held to the finish, as there were few opportunities in the south west wind to pass. Steve Graham gave chase to hold second spot from club team-mate Armstrong, who was at his consistent best. In the third race, Hopkins again started well to lead at the first mark, which was closely contested. He was able to hold this lead to the finish and win the event, while Adam Savage rounded second, also held to the finish, despite close chasing from Chris Massey of the host club. Steve Graham managed to get to 4th place after gaining the advantage in an incident between Armstrong and Whitehead, and clinch 3rd place overall. Armstrong’s steady sailing gave him the runner-up spot. With several of the Merlin fleet now going off to Salcombe, it was the Solos who were most numerous for the evening races. The wind held enough to give Oliver Whitehead enough competition from Chris Massey in the Solos. The results were similar for both races. The Club hosted a round of the NW Senior Travellers Series. There were 19 contenders with 6 home boats entered and, sailing consistently, Mike Butler and Steve Caladine (GP14) came best at 4th overall, doing well against the single-handers. Next was Dave Smith in his Solo (6th), while Gary Butler (Laser) was 8th. Surprisingly, the Merlin Rockets did not do quite as well, with Martin & Rene Watts in 10th and Roger and John Mee close behind in 11th. It was a very busy weekend for sailors at the Lake as the Club celebrated its 70th Anniversary. On Saturday, in strong gusty conditions a pair of boats match raced against each other like the America’s Cup. Lacking Ben Ainslie, the results were not one-sided! In the harbour area, young sailors enjoyed a Pirates Party with plenty of opportunity to get wet. In the evening, members dressed up in 1940’s style and partied to a Swing Band and remembering those who initiated the Club from small beginnings. On Sunday, there was a great turnout to challenge for the Founders Plate. Following a sequence of 3 races, the leading 3 boats qualified for a final Pursuit Race. There was close racing in the Merlin Rockets, while the Solo and GP14 results were never in doubt. For the Pursuit Race, over a pre-set time, the slowest boats start first, while the fast Merlin Rockets have to wait several minutes. So the boats were led away by the Solos. Steve Denison is not often racing at the Club and had won the Solo Northern Championship a week ago. Oliver Whitehead challenged hard and then the GP14 of Ellie Davies and Adam McGovern caught up. The winner was indeed Steve Denison in the Solo with Ellie Davies close second and Oliver planing to the finish in a last moment bid for runner-up. It was a relief that there was a sunny evening with the prospect of racing after heavy afternoon rain. Perhaps that accounted for only 10 boats launching. First away, the Lasers got off into the shifty north west wind. Richard Whitehill got the shifts right and was away to a clear lead, which might have been lonely if the Merlins had not caught up on the second lap. The Merlins were led by Steve Crook and Sally Townend but, on the beat between B and A, Nick Heginbotham and Evan Parry gained the lead on the shifts. That was fine until the second lap when the opposite shifts paid and Steve Crook regained the lead to the finish. There was a battle behind between Gerald Whitehead (with David Thompson) and Ian Laing (with Steve McCann) where Ian held the lead for some time. Darker clouds brought fresh wind for the second race. This time the Lasers raced closely, thought the result was the same. Steve Crook fired away into a strong lead on a good spinnaker reach between E and B marks. Sunday dawned fine at the Lake with a moderate westerly wind. Sailors were however slow to get out for the first race and this impacted on some of the results, because it is not easy to catch up, especially if the wind is shifting! A lone Laser sailed with the Solos for the first race, but changed to race in one for the third race, which he then won! Ste Mason does know how to race a variety of boats. There was a very close finish for the Merlin Rockets in the first race where Julian and Evan Parry held off the challenge of Steve Crook and Sally Townend. Martin Brennan tried his hand at the helm of a Merlin with Andrew Hilton, making a change from sailing a Solo or a GP14. Next weekend, the Club celebrates its 70th anniversary with many events over both days. Another sunny evening with 14 boats out to race in a light southerly wind. For the second race, the wind soon started to fade and the race was shortened. Then a black cloud came along bringing fresh wind, but it was too late. The Laser results has a change to the usual pecking order with Steve Crook trying his hand and winning the second race. Before the rain came on Sunday afternoon, sailors were having some close racing at the Lake in good wind conditions. Despite the closeness of racing the Merlin Rockets showed consistent results in all 3 races, with Steve Crook and Andrew Hilton always coming out on top. At the other end of the scale, Peter Bramwell was introducing his children to sailing in a Mirror. On Saturday, 4 of the Club’s young sailors were at Southport racing in a Junior Travellers Series. Adam Din finished 4th, ahead of Will Smith (5th) in their Laser Radial boats, while William Rowland (10th) and Evan Parry (18th) sailed the smaller 4.7 rig boats. William and Adam are currently leaders in the series. 17 boats were out to race in the north-easterly wind with enough strength to provide some occasional excitement. The two race back-to-back format is giving closer racing which seems popular. Chris Massey and Oliver Whitehead were ‘nip and tuck’ in the first race but the second race saw Chris Massey over the line at the start and having to fight his way back to get near to Oliver. In the Merlins, Steve Crook and Sally Townend were able to withstand the challenge of Nick and Holly Heginbotham in the first race, and Stuart Bates and Andy Hilton in the second both keeping the winner on his mettle. On Sunday, Laser sailors competed for their Open event. 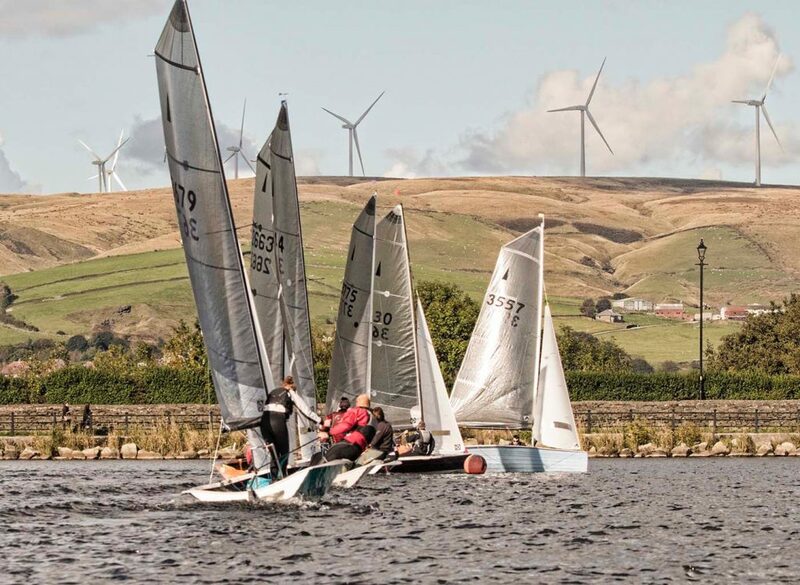 20 sailors entered with a strong contingent from Dovestones, who dominated the results. Best placed local was Gary Butler in 7th place. Of the Club’s young sailors William Rowland (12) came 9th, Evan Parry (13) just behind in 10th, while Adam Din (14) sailing a smaller Radial sail was 12th. Conditions were particularly difficult in the rain and very light fluky wind. On Saturday, the Club hosted an 8-Hour relay race for local OnBoard Clubs, with teams of junior sailors. 11 teams competed, bringing 63 young sailors in all. The winners were from Burwain as the host Club team suffered misfortune in the lead, finishing third. In a contrast from the previous week, there was sunshine after a thundery afternoon and some heavy rain locally. The easterly wind had returned and promised good sailing at 19.00, but became very patchy and shifty with occasional stronger ‘cat’s paws’. The first race was shortened to 1 lap, but the second was held for 3 laps on a triangular course. Ste Mason, in his RS400, showed the Merlins interesting downwind manoeuvres while leading. The Solos and Lasers started together with Chris Massey comfortably leading the Solos, while a battle ensued behind between David Hughes and Ron Simpson. Despite sometimes leading the Lasers, Richard Whitehill took second place to Gary Butler and Will Rowland, on handicap, led his father in the first race. 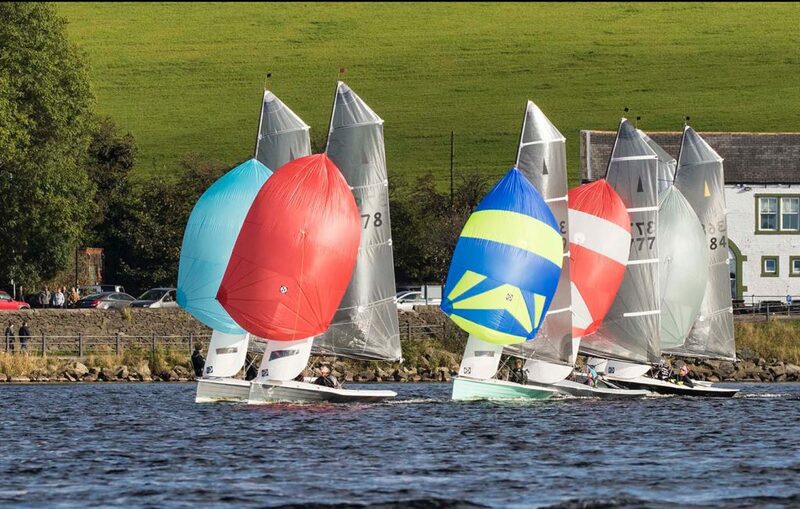 Hollingworth Lake was the place to be at on Sunday with sunshine and a light wind. From the perspective of sailors, the wind varied in direction and strength but always coming from the east. Racers seemed to take their time setting out to race, so Kevin Parry had a chance to lead the Solos for the first race. David Hughes had found an Enterprise dinghy with its distinctive blue sails and asked Martin Brennan to take the helm, mixing it with the GP14 fleet. After a win in the first race, they had to settle for third place in the other races, lacking the spinnaker that gave the GP14s an advantage. On Saturday, 3 of the club’s young sailors were at Bolton for a Junior event where Will Smith finished 2nd, Adam Din 8th and Will Rowland 9th. Overall, after 5 events, Will Rowland is leading the series with Adam Din in runner-up slot. It may now be June but, with a cold and strong north-easterly blowing, there were few takers. The most numerous were out in Lasers who enjoyed close racing in the first one where Chris Massey beat Adam McGovern. For the second race, the leadership was reversed. Otherwise there was just the single Merlin and GP14. Sunday at the Lake offered lovely sunshine and a pleasant north-easterly to whet sailors’ appetites. The wind was shifting and occasionally patchy. Sailing towards the Rakewood end, there were advantages in heading closer towards the dam wall on Rakewood Road. Places changed in spotting such possibilities. Roger Mee, with his Championship winning son Matt as crew, won the first race in the Merlin Rockets but had to cope with a strong challenge by Martin and Rene Watts in the second one. Martin Brennan was in good form in the Solos, only beaten by Mike Smith in the second race. Another pleasant evening for 2 races back-to-back where the wind held up reasonably well though quite shifty. 19 boats were out racing. Occasionally there were flat spots and in the first race downwind, Andy Wake and Kevin Parry in the Solos seemed to stop for a chat. Both had their moments of glory, though victory went first to Chris Massey and to Oliver Whitehead in the second one. Light wind experts Martin Brennan and Sophia Miles, fresh from their Open Meeting win took the bullets. Graham Knox and Steve Caladine had a tussle with Richard Mason and Nichola Thomason for second place in the GPs. Adam McGovern had two clear wins in the Lasers. The Merlin Rocket results were totally consistent with Steve Crook and Sally Townend leading ahead of Martin and Rene Watts who had started well in the first race. Like many parts of the country, the Lake on Sunday suffered from fickle winds that made organised racing variable. The Club had organised the annual Open event for GP14s and Mirrors. 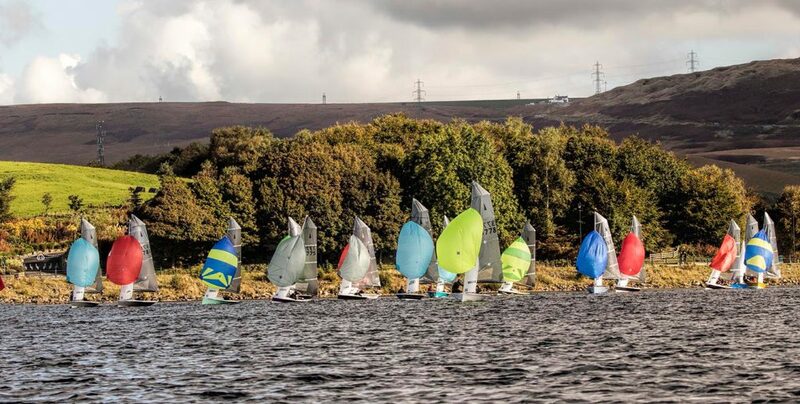 Scorpion dinghies had also been invited to join the racing and 8 boats, several from across the Pennines, came for the day. The Scorpions enjoyed close racing with 4 potential winners. National Champion Andy McKee from Dovestones, with Chris Massey (known for his Solo sailing success here) looked strongest contenders, but Steve Walker and Jerry Hannabuss were close and won the third race to win overall. Ironically Walker last won an event here back in 1981 in a Mirror! The GP14 racing was won by Martin Brennan and Sophia Miles having taken the win in the first two races. Steve Crook and Steve Caladine won the third race to take second overall. Away from home, Steve Denison won a Solo event at Carsington in equally fickle winds. The strong wind was now coming from the north east so there were fewer boats out. Will Rowland in his Laser 4.7 showed the older hands the way round as he was not as overpowered as the others and will have won on handicap. Some capsized more than a few times. Adam McGovern with Ste Mason in a GP14 flew a spinnaker to gain a clear lead Martin Brennan and Sophia Miles took a more conservative approach. Conditions were fine for Chris Massey in his Solo while Ron Simpson found it on the limit though enjoying the downwind planing legs. Bruce Mager and Craig Jowett were the sole Merlin sailors. Results were the same for all in the 2 races. Steve Denison came 2nd at West Riding’s Solo Open at the weekend. Two of our young sailors have earned selection for Laser 4.7 championships over the winter season. By competing in a Gul ladder, Adam Din and Will Rowland have earned places out of 17 selected to sail in the European Championship at Morgat in France during July, while Will has also been selected (out of 10) for the World 4.7 Champiosnhip at Kiel in August. Their progress will be watched with interest! When the wind blows from the east and there is warm sunshine, it will be breezy! So it was on Sunday and gave exhilarating conditions for racing. Chris Massey was up for it in a Solo and took all the bullets, despite strong competition from Nick Brook, early leader in the first race, and Martin Brennan. Nick Heginbotham, with daughter Lucy, was in great form in the Merlin Rockets but unable to hold off the challenge of Julian Parry (and his son Evan) in the third race. Two GP14s were out in the hands of veterans who tired after 2 races but enjoyed close racing. This was a lovely evening to try out the scheme of 2 short races back-to-back for the next 3 months. There was a good south westerly breeze that held for the time needed. With 19 boats out it was clearly a good evening for this trial. First away, the Solos were led by Nick Brook in the first race, with Oliver and Chris Massey in pursuit. A couple of GP14s were led by Martin Brennan and Sophia Miles. Next came the Lasers where Adam McGovern was overtaken by Gary Butler. The 6 Merlin Rockets also enjoyed close racing with Nick and Lucy Heginbotham taking the win from close competition by Martin & Rene Watts and David and Oliver Winder. 3 Laps of the short course were sailed in half-an-hour. Then it was a quick turnround for the second race with Oliver Whitehead now taking the Solo win. Adam McGovern held the Laser lead against Gary this time, while David & Oliver Winder cruised into the Merlin lead. With the wind easing, this race took a little more than a half-hour. There was plenty of chat afterwards as Pat Brook had organised an excellent meat and potato pie supper much enjoyed by all present. Competition at the Lake took on a different form on Sunday when 4 different pairings raced in GP14s. As some of the crews were unused to spinnakers, they all agreed not to use them and the result was some closer racing than usual in the drizzle and strong westerly wind. This gave the chance of fast downwind planing conditions. Some were caught out in gusts and capsized. Oliver Whitehead might have been the winner in all 3 races but for this misfortune in the second race! Two Merlin Rockets match raced in family pairings. Again the final result was close as each had a time in the lead. The evening started with snow falling which might have led to the wind holding but it was not to be. As the 9 boats started the wind shifted and dropped. The GP of Martin Brennan and Sopia Miles appeared likely to lead though the lighter boats soon caught up and overtook. Nick Brook was the next possible leader but finding air to keep ahead of Chris Massey proved difficult. The results given are in the actual order of finishing. David Hughes was around to regale the story of sailing on the Ijsselmeer in Holland in the Solo Nations event. It is shallow and bumpy when the wind blows strongly. 26 young sailors raced on Saturday in the NW Junior Travellers Event. They coped well with a gusty north-west wind and suffered a few capsizes. It was rather different on Sunday with an indeterminant wind for the first race, as it had little strength until the second race when it steadied from the north. Nick Brook, in a Solo, always led the way round the first mark in each race, but was eventually passed by Martin Brennan in the first two. The 3 Merlin Rockets changed places often for the lead but it was Steve Crook and Jane Clayton who took the bullets. A lone GP14 was out for the first time this season. It was another glorious summery evening with a good easterly wind blowing. There were 19 boats out to race. First away, the Solos were led by Nick Brook, with Oliver Whitehead in hot pursuit. On the final lap Oliver managed to break through and establish a clear lead, which was fortunate as the wind started to die about 8pm leaving others struggling. The wind then started to change direction as the sun went down behind the clubhouse. Some boats were left stranded for a while and there were some dramatic changes of place, until the wind sorted itself out a bit. There were a few retirements as the temperature dropped. The lovely sunshine at the Lake brought the crowds but the cold westerly wind made for frisky conditions for sailing. Chris Massey and Martin Brennan battled in the Solos with Martin losing out on the shifts in the first and second races. Bruce Mager and Craig Jowett had an easy time in the Merlin Rockets, where Gerald Whitehead and crew capsized. On Saturday, the Club will welcome many young sailors to compete in an event of the North West Junior Travellers Series. It might almost have been a summer evening with sunshine and a light westerly over the Clubhouse. So the wind started to die soon after the Solos started and the Merlins had to cope with little wind at the first mark, though all bunched together there. Martin Brennan, in Kevin’s Solo was last early on, but gradually found a way through to lead. David and Oliver Winder in a borrowed Merlin managed to fend off the challengers to win. After the first race, the clouds started to build and the easterly wind became stronger, leading to a few capsizes and a reluctance by several to continue racing for the day. Away from home, David Winder and Pippa Taylor were chasing Silver Tiller success with a third place at Banbury Open Meeting for Merlins. Race 2: 1.S Crook/S Townend others retired! What a contrast from Sunday as vicious gusts and hail came alternately with fine, calm periods. Oliver Whitehead and Chris Massey raced in their Solos from a line start and finished in that order, with Richard Whitehill in his Laser joining in too. There was an excellent turnout to race on Sunday at the Lake. With sunshine and a westerly wind veering to the south good, competitive racing was to be had. First away in the Solos saw Martin Brennan built a great lead with Nigel Davey offering the best competition. In the second race, Nick Brook got clean away and in the third race he had a long battle with Martin Brennan who almost caught him on the finish line. The Merlin Rockets were out in strength too. Martin and Rene Watts led the first 2 races comfortably, ahead of Julian and son Evan Parry. They were caught out in the third race when Tom and Harry Daniel found form and used their growing experience to hold on to second place over 5 laps. Mike Butler and Steve Caladine raced successfully against Colin Knott and Richard Long in the GP14s in the first race and then held off the challenge of Andy and Elmarie Carter in the second race. There were several young sailors out in their Lasers too. But Will Rowland and Adam Din decided to do the third race in the RS200 but capsized twice. Being young helps as getting the boat righted and off again is part of the fun. Early arrivals at the Lake would have welcomed the fair breeze off the Lake Bank for the first evening race of the year. The 10 boats out to race started with a shifting breeze to beat towards G mark. As the sun went down so did the wind. Steve Crook and Sally Townend, followed by Martin and Rene Watts, were the early leaders. By the third mark, that lead had changed and the Watts led to a shortened finish as the wind died. Martin Brennan, in a Solo, was keeping up with the Merlins. So, on handicap, Martin Brennan was first, with Nick Hornsby second, beating the Merlins. With the Easter Fair in full swing at the Lake, it looked to be exciting on the water too. The strong westerly wind held some fearsome gusts so there were only a few takers. Among those keen to race was our visiting local Olympic sailor who took out his father’s Merlin Rocket, with crew Catherine Kimberley. At first, he was under pressure from the other 2 Merlins, as Julian Parry and Ryan Richards led for much of the 3 lap race, but succumbed on the third lap. Justin Smith and Adam McGovern showed how fast a GP14 can sail though not able to keep up with the Merlins. As the first lap of the second race was about to be completed, lightning and thunder broke and for safety reasons, racing was abandoned for the day. The Lake looked attractive in the sunshine on Sunday but the wind was not ready to play its part. It came from many directions making it difficult for the Race Officer to set a course. The first race was a Pursuit with the slower boats starting first. This was won by Martin Brennan in a Solo who could ‘sniff’ out where the light air would keep his boat moving. Second was Guy Winder and Tom Murphy in a Merlin Rocket ahead of Steve Denison in another Solo. Two of the scheduled races for the Frostbite Trophies were completed with the Merlins having some close racing, and the Solos being the most numerous. The spring weather at the Lake encouraged more boats out to race and many to walk round. The easterly wind may be cool but it provides the best opportunities for tactical racing. 9 Solos enjoyed ‘nip and tuck’ racing with Oliver Whitehead again showing great form. Others swapped boats to see if there were speed differences and Steve Denison tested a new version to win the the third race. There were 3 different winners in the Merlin Rockets who also enjoyed close racing. The Lake’s sailing season began on Sunday with the usual 3 races in fair conditions. 6 Solos took to the water and, in the first race, one of them was too keen and capsized. He asked not to be named but rumour has it that he wanted to test his new drysuit! The results showed that the usual trio remain frontrunners with Oliver Whitehead taking the first two races and Martin Brennan the third, while Chris Massey had to settle for seconds. Over the winter, Adam Din has been racing at Leigh in a Sunday series. That Club held a Winter Junior Regatta on Sunday for 12 boats and Adam scored 4th overall in his Laser and Will Rowland finished 6th. This year we have produced, for our members, a four page pdf document that lists the club’s racing, recreational and training programmes, all our social events plus all the various rotas (i.e. OOD, Duty Officers, Starters Box, Instructors, Galley, Bar & Keys) for the entire 2016 season. It can be found on the Club Events & Duty Rotas page of the Members’ Area. Please click here to view and/or download it. There has been some juggling around of the berths for this season so please click here to view the 2016 Berth List or have a look at the list on the Sailing Committee noticeboard. Brian He ron, who had been a member of HLSC for nearly 70 years and was a past Commodore, died on Thursday 11th February in Rochdale Infirmary after a short illness. Brian was 83.
er listed as such is because he was only 13 years old at the time and so was not eligible to be formally recognised as such. The club was initially set up by the Simpson brothers, Mr F. Butterworth and Brian at a meeting in his mother’s sitting room at 85 Lake Bank. Brian was a very accomplished sailor, a good team racer and was the Firefly national champion three times and won the Gore twice at a time when there were about 200 Fireflys at the championships. In later years, when the Firefly fleet at Hollingworth Lake dwindled away, Brian turned his talents firstly to Merlin Rockets where, on home waters, he was a strong contender including winning the Felucca Trophy. Later he tried his hand in a GP14 where he was a tough competitor and not easily beaten. He served the club well, not only as the club’s Commodore between 1969 and 1971 but as our Sailing Secretary, our Hon Treasurer, one of the club’s trustees and he was also on our Management Committee for a long time. At Management Committee meetings, when the committee was getting bogged down in argument, Brian always seemed to have the uncanny knack of succinctly summing up the issue and steering the committee towards the correct decision. In 2004 Brian was appointed a club Vice President. Away from HLSC Brian had a very full life. After obtaining a mathematics degree at Cambridge University (St Catherine’s), Brian worked for Turner and Newall where he moved up the management ladder until, eventually, he was appointed Chief Executive of TBA Products. Following his retirement from TBA Brian became involved in public service. He was founding chair of both the Rochdale Training and Enterprise Council and the Rochdale NHS Trust, assuming national responsibilities in the health service. He was Pro-Chancellor of the University of Manchester Institute of Science and Technology from 1990 to 1996. He then became Pro-Chancellor of the University of Lancaster, serving as Chair of its Council from 1997 to 2003. Brian received honorary degrees from both universities, in 1997 a Doctor of Science degree from UMIST and in 2003 a Doctor of Laws degree from Lancaster University. During the festive season some of our sailors have been out and about competing and often winning, or at least being in ‘the chocolates’. At the Eskimo Trophy at Blackpool & Fleetwood YC on 28th December, Steve Crook and Sally Townend finished 5th overall in their Merlin Rocket. 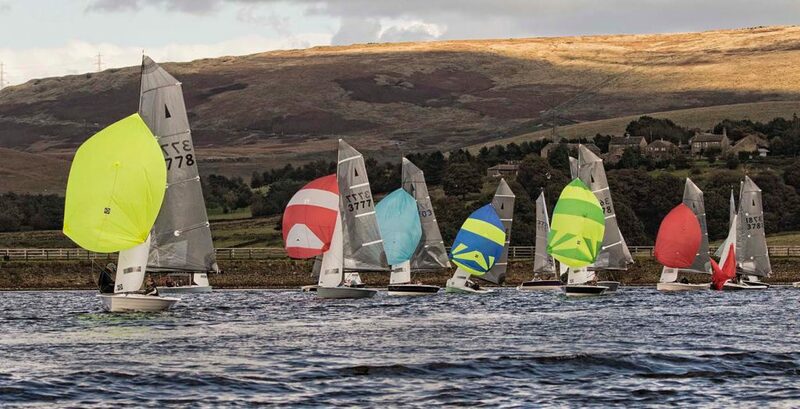 At the Brass Monkey event at Yorkshire Dales SC the winner was Matt Mee and Lucy Yeates in the RS200 (he had also won at Budworth on Boxing Day with Emma Norris), while Dave Winder (with Ben Rayner) came in 16th in a Fireball. Adam Din was the lone club representative at Leigh & Lowton’s New Year’s Day Pursuit, where he finished 39th in his Laser 4.7. You will be aware that at our Club AGM there was no nomination for Commodore. So in accordance with our Club Rules this left the Management Committee to decide our next Commodore. At their meeting last Monday ( 4th January) Steve Caladine was elected to the post, unanimously. He welcomed several members new to the Management Committee and has plans to try to ensure that our 70th Anniversary year is one with renewed vigour and activity.